Python conservation could benefit from captive breeding. 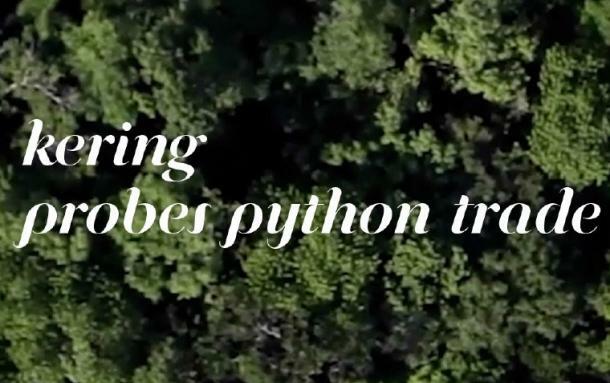 The first report under the ‘Python Conservation Partnership’, a collaboration between Kering, the International Trade Centre (ITC) and the Boa and Python Specialist Group of the International Union for Conservation of Nature, has been presented today. The “Assessment of Python Breeding Farms Supplying the International High-end Leather Industry” is a study evaluating the economic feasibility and viability of captive breeding of pythons as a possible element of sustainable use and conservation of the species. Its aim is to provide guidance to those involved in the python trade to adopt sustainable practices when sourcing skins. According to the report, python farming could help reduce pressure on wild python populations in Asia. The practice, however, should be viewed only as part of a holistic approach to python conservation and additional research on python farming and trade is required to determine its conservation benefits and impacts on livelihoods. The report also found that greater emphasis on the conservation of python species in the wild is needed. Key recommendations from the report include putting in place systems to ensure that python farming is well documented and that any trade is sustainable, legal and does not encourage trafficking from the wild under the guise of farmed animals. The study also highlights the urgent need to develop techniques to differentiate between captive-bred and wild-caught skins. The Python Conservation Partnership is currently addressing this issue by working with Viet Nam to research innovative ways to determine whether skins are derived from captive-bred or wild sources. “Our drive and commitment to sustainable business includes going deep into sustainability across our supply chains, right to our sources,” said Marie-Claire Daveu, Chief Sustainability Officer and Head of international institutional affairs of Kering. “This first report and the continued work we are doing in the Python Conservation Partnership to enhance traceable, sustainable sourcing and the conservation of pythons will assist our sector and move the industry towards more informed decisions in python sourcing. We will be proactive in addressing these recommendations, and in particular developing best practice guidelines in the PCP for captive breeding farms and training the suppliers we work with." Python skins are traded primarily to meet demands from the fashion industry to make luxury leather products, with Italy, Germany and France being the biggest importers. Skins are also used for traditional Chinese musical instruments. Indonesia, Malaysia and Viet Nam are the main source of python skins, with China, Thailand and Viet Nam all producing python skins through farming. Southeast Asia’s pythons, the Reticulated Python (Python reticulatus) and the Burmese Python (Python molurus bivittatus) - which are two of the world’s largest snakes - have been harvested from the wild for their skins for almost eight decades. Within the last 20 years, the scale of trade in python skins has increased significantly with nearly 500,000 skins exported from Southeast Asian countries per year. Continued increase in demand is likely to put significant pressure on wild stocks, according to the study. The report will be presented at the Animals Committee of the upcoming Convention on International Trade in Endangered Species of Wild Fauna and Flora (CITES) meeting in May 2014 to contribute to the discussion on international snake trade. For an overview please see the Executive Summary. The Species Survival Commission (SSC) is the largest of IUCN’s six volunteer commissions with a global membership of around 7,500 experts. SSC advises IUCN and its members on the wide range of technical and scientific aspects of species conservation, and is dedicated to securing a future for biodiversity. SSC has significant input into the international agreements dealing with biodiversity conservation, as well as compiling information on the status of wildlife for the IUCN Red List of Threatened Species™. The Boa and Python Specialist Group (BPSG) is a global network of volunteer experts on boa and python species, part of the IUCN Species Survival Commission (SSC). The BPSG is the world leading authority on boas and pythons. Its mission is to provide expert opinion and scientific advice to IUCN and other conservation organisations, government and non-government agencies, applicable to the conservation of boas and pythons.